'Surgiamo' is a very comfortable long distance cruiser and live aboard. 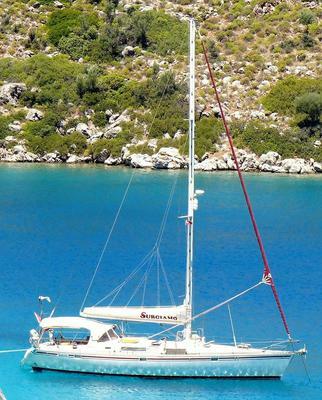 Since the purchase in 2002 we have very successfully sailed across the Atlantic to Turkey. Since then we have cruised the Mediterranean during the summer season (May-Oct), we normally left the boat on the hard through the winter in Turkey. With large tankage and much storage, she is able to cross long and far very comfortably. 3 cabin owner’s version layout, each cabin c/w full ensuite (shower, sink, Raritan head, storage). Master cabin fwd has double bed ( 5’ x 6’10”) that you can walk fwd on either side , 2 hanging lockers(one converted to 4 deep shelves, 6 drawers, 2 opening overhead hatches, and 2 opening hull hatches , and large ( 32’x58’) private head on aft side. 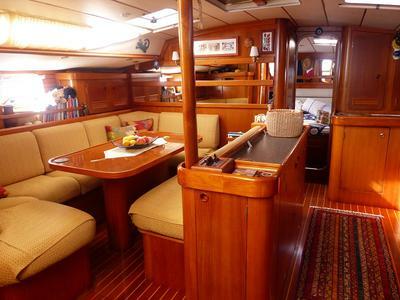 Beautiful classic airy teak salon c/w teak table for 6, 16 visible cabinets, central 16” wide island over main engine separating galley from dining area, 6 windows, 2 overhead opening hatches, 1 opening hull hatch, large overhead central skylight. P/S aft cabins with walk in full headroom, hanging locker and each cabin has 1 opening hatch and 3 opening portholes for ventilation, 2 storage drawers. 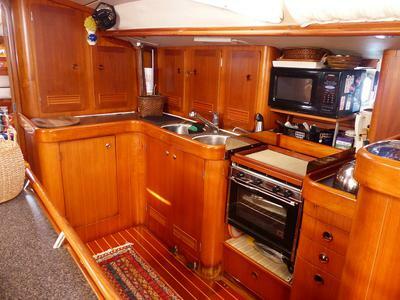 Galley includes Electrolux stove/oven, 110 V microwave, top loading freezer, side loading fridge, (separate compressor systems), hot/cold pressure water, foot pump for fresh water, foot pump for sea water, much storage. Forepeak contains a full size 110V washer/dryer, workshop c/w bench vice, 110V grinder/wire wheel, sink, tools, spares, materials, etc. Interior fully wired for 110V and 220. Balmar 100A alternator with MC612 remote regulator for house banks. 600W 12V to 220V inverter. 1800W 12V to 110V inverter. Master volt 70A battery charger. 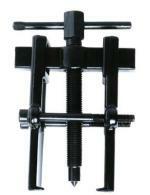 Model; 12/70-3 which accepts 110V or 220V inputs. 7 220V outlets, 7 110V outlets throughout the interior spaces. 2 kw portable gas generator (New 2016). Fuel; 150 gal. (570 litres). Water; 360 gal. (1360 litres) 4 tanks. Holding tank; 20 gal. (75 litres). Tight, dry 80 hp Perkins 4.236 F/W cooled engine c/w oil cooler; Hurth 450 hydraulic transmission c/w oil cooler; driving a 20” dia SS 3 blade feathering propeller made by Autostream. Same operation as Max-Prop in forward, BUT much better in reverse. Provides very good maneuvering in tight Med. marinas. Slightly swept twin spreader rig c/w double lowers, inner forestay, running backs, 2 spin halyards, 18’ spin. Pole. Outer shrouds are 9/16” (14mm), lowers are 15/32” (12mm) and 13/32” (10mm). Large balanced rudder and 6’ deep wing keel give terrific steering control for fine sailing qualities upwind and downwind. In mast furling system still available. (I changed to classic main when I bought the boat). Excellent quality Sunbrella dodger & bimini (new 2015) c/w rollup side/stern mesh sun shades. 5 windows with covers (3 open) in dodger, and 3 in bimini. Rollup 16’(4.9m) sun shades P/S (new 2015) attached to boom c/w extra side skirts to block sun from cabin top. Very useful in hot days..
New teak decks and cockpit in 2015. 2015 3.2m RIB c/w canvas cover over pontoons with best idea towing painter; Honda 8hp outboard; dinghy anchor. Magma SS BBQ c/w 20lb propane tank. 130m of 40mm wide strapping stern line to shore on SS narrow wheel. Boom gallow to lift motor onto bracket on stern pulpit. 6 man AVON life raft. 2KW portable gas generator (new 2016). Dedicated fuel locker with outboard venting. 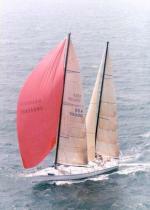 Passarelle, 2.5 meter folding, 2 positions on transom. Swim ladder folds away in transom. Main anchor, 20KG original Delta c/w 190 feet of 1/2" galvanized chain (regalvanized in 2015). 2nd Anchor, Fortress FX37 c/w 190 feet of 7/8" braided anchor rode. Lofrans "Tigress" 1200V anchor winch.